Gotwarcraft note: This guide was originally produced for patch 5.2, we’ve updated it for Warlords Season 1. This page covers just the gear and stats and such, you can see our WindWalker PvP page for more general info. For all the Warlords changes to Monks go here. Naturally this guide assume that you’re level 100. If you’re not, then go here and get leveled. Stat Priority – These are the stats you need, for best effect. Getting Started – Ok, you’re now 100. Here’s how to start. Honor Gear – The next stop, getting ready for tougher stuff. Conquest Gear – Now we’re getting serious. 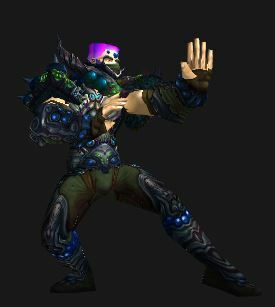 Windwalker Monk PvP Professions – No longer for the buffs. Consumables – Useful foods and chemicals. Haste, Mastery, and Crit are pretty close in value. Agility increases your Attack Power and so increases all of your damage. It no longer adds Crit. Versatility is a direct add to your damage, your healing, and (at half value) your damage reduction. The defensive value is a good part of the reason that it ranks so highly. Multistrike gives you one chance (two in PvE) at an additional strike or heal at 30% effect. This is your “attuned” stat and you get an extra 5% from all sources with your level 90 Battle Trance ability. Multistrikes can crit and are increased in damage by your Versatility. Critical Strike, or Crit, is one of the best secondary stats for a Windwalker Monk. In PvP Crit does 150% damage, 200% in MvP. Also, as an Agility class, you start out with 15% base crit. Monk play style centers around lining up very strong burst damage in conjunction with your teammate. Critical Strike increases the likelihood of solid damage output during your important cooldowns, namely Rising Sun Kick, Fists of Fury, and Invoke Xuen, the White Tiger.This is the most valuable of “the rest” of the stats. Haste is esp. important if you’re taking the Chi Brew talent over Ascension (which is recommended.) You will want to extra energy regen that Haste gives you when using Chi Brew. The problem with Haste in Season 1 is that you won’t be able to get enough of it on your gear to make any difference. Mastery – Your mastery, Mastery: Bottled Fury generates brew stacks faster, allowing you to use those stacks a little more often. The problem is that that speed improvement usually doesn’t matter much as you’re saving stacks for later use anyway. There is no PvP gemming in the Warlords of Draenor, not as of Season 1 anyway. Will it happen later? We’ll see. The gems exists, but there are no sockets on PvP gear, only on some raid gear. An easy way to go is just to drop Agility gems (Delicate Primordial Ruby) into all sockets and ignore any bonuses, esp. since they’re be tiny. Meta: the Agile Primal Diamond adds some damage until you can get the Tyrannical Primal Diamond. Consider using the Powerful Primal Diamond for the reduction in stun duration. it’s not a lot, but it will get you out of that Rogue/Warrior stun just that much sooner (it also stacks with Orc stun resistance.) The legendary gem, if you can get it, is also quite nice. Yellow: Deadly Vermilion Onyx – You probably already have enough Haste from your gear by this point. Cogwheel equires an engie helm, such as this. Note that these are the same as the PvE enchants. Weapon note: Depending on your interests you might want to try the bleed instead of the stat increases. Mists enchants can only be added to items under ilevel 600. Warlord enchants can be added to any item, including level 1 heirlooms. Upon achieving level 100, we do NOT advise you to just jump into an Arena, or start grinding Battleground’s, or do any sort of PvP for that matter fresh off of leveling in your leveling items. Chances are many of the enemies in a Battleground will seriously out-gear your fresh level 100, which means they will have a major advantage over you in a PvP setting. There is no crafted PvP gear in Warlords, unlike prior expansions, but you can equip some pretty decent PvE gear at level 91. This is going to cost you some time and work in your garrison or a fair amount of gold, which you should have if you quested your way to 100. If you don’t then see our gold tips and earn some. Depending on how fast you’re gaining honor, and your cash supply, you might want to skip the expense of the enchants, even though they will give you a bit of a plus. Most of this section assumes that you’re at least level 90, but if you’re lower level you shouild be able to get an idea or two from it. Remember that Resilience and PvP power are dead on high level gear. They do appear on lower level PvP gear, but it’s not likely that you’ll be able to gain enough to be interesting. Crafted Malevolent Gladiator’s Medallion of Tenacity – This is #1 if you don’t already have something similar, otherwise save the gold. Crafted Malevolent Gladiator’s Ironskin Gloves -Your Gloves come with the major benefit of clearing all movement impairing effects whenever you use your Roll, Chi Torpedo (when talented), or Flying Serpent Kick abilities. This allows your Monk to stay very mobile and increases uptime on your target dramatically, in addition to saving your PvP trinket for roots and such. Crafted Malevolent Gladiator’s Ironskin Tunic – 2 piece set bonus increases the range of Fists of Fury and Keg Smash. Crafted Malevolent Gladiator’s Ironskin Legguards – 4 piece set bonus for +5% damage. 91? Yes. While there is no crafted PvP gear in Draenor you can equip high level crafted crafted PvE gear at 91. You can only equip three pieces though. On the other hand, you can reroll stats on pieces that need it and you can upgrade the pieces (for a hefty price.) Weapons start at 630 and the armor at 640. This gear will carry you through till 100, when you can get the official PvP stuff. PvE gear is uprated in instanced PvP to 650, but the PvP gear starts at 660 and so is clearly better. Very high level raid gear will be better than any but the Conquest gear, so if you’re decked out in 675+ raid gear keep it and work on the conquest gear. 2 piece: When you use Roll, the Energy cost of your Jab is reduced by 30 for 3 sec. Example chest items for the Conquest gear. Honor is similar, but without the Rep piece. The rep pieces are the only way to get Versatility on your Conquest gear. There is no Versatility on the Honor gear. Primal Gladiator’s Tunic has no bonus, it comes with Crit & Multistrike. 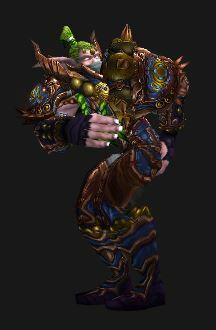 Primal Gladiator’s Chestguard is the Rep piece, has no set bonus, and has Haste & Versatility. Another set bonus is from your PvP trinkets. Equip two (one medallion and one emblem) and you get a 10% damage reduction Vs all player caused damage. This season, there are three pieces of conquest gear for each slot. In hopes of creating a more level playing field, Blizzard has decided to do away with rating requirements for all items (except for the weapons.) This means that all players will have access to the best PvP gear available, provided they earn enough conquest points to purchase the items. These are the Versatility pieces (all Alliance, but the Horde pieces are the same.) All require Revered rep with Wyrnn’s Vanguard or Vol’jin’s Spear. If you want the set bonuses then you can get them without the rep requirement and then get the rep for the remaining pieces. Your Weapon(s,) neck, rings, and cloak can be enchanted. You will need 7,250 Conquest points to get your weapon(s,) but the honor pieces have no such requirement. In that case get your weapon first. For the Honor set go ahead on grab the Ironskin pieces, since there is no Versatility set. For the Conquest set give it serious consideration. Pick any four for the 4-piece set. Other items that do not have the set bonuses, rep requirement, or Versatility are listed also. No set bonuses, no rep required, no Vesatility. Weapon: Primal Gladiator’s Pike – All the weapons are Crit & Mastery. 2h weapons have more stats then the pair of one handers, but with the latter you get two enchants. All the Versatility (Rep) pieces are listed here. If you’re going for the honor version then get the weapon first. Is Gold a Problem? It won’t be if you have Tycoon. Click here and make a Lot More Gold. Warlords killed off all of the profession perks. There is no longer a Leatherworking Agility enchant, no more Agility cooldown from Engineering, etc. You can make some useful starting pieces, but there is no PvP specific gear and no special bonuses, and non of the special items can be used in rated PvP. Leveling a new profession used to be costly, but the Warlords professions are easier, faster, and much cheaper than before with your Garrison. Blacksmithing Mail and Plate armor and weapons. Keys for locks. Leatherworking will let you make entry level armor for raids (ilevel 640.) You can also make the items to reroll the stats and also to upgrade the items to 665, at a cost far exceeding that of the original piece. You can also make Drums of Fury for a Heroism type buff (25% Haste for 40 sec.) Through the Leatherworking hut in your Garrison you can make single use tents that will increase your agility by 10% for an hour. Various consumables will have some use outside of rated PvP. Note that Pandarens get twice the food buff. All food buffs last one hour. Any Agility bonuses (such as your level 50 leather bonus) also add to the food and chemical bonuses. This guide was originally produced by SkillCapped. All of their written guides are available for free, and they encourage people to post them wherever as long as a link back is posted! Like the page? Does it need work? Feel free to add a comment below and/or share this page. Please let us know how the article was. Were we missing anything? Do you have any further questions? Was the format useful? We always want to improve our articles, and your feedback helps!